They say fortune favors the bold. And we agree, especially when we’re talking about outfits. Opposite of demure and understated, we’re going full maximalism and exploring three fun ways to create memorable looks. Keep reading as we show you why sometimes, more really is more. For our first look, we’re diving right in with a dramatic all-over print. We love wearing them on our maxi dresses or jumpsuits because the airy silhouette helps bring balance to the striking visuals. The end result? A one-and-done piece that feels fun, fresh, and still very effortless. But if you still feel a little reluctant about donning a vibrant pattern head-to-toe, don’t worry, we’ve got an easy style tip for you. Try throwing on a denim jacket and neutral accessories to help tone down the look. Textured pieces are amazing on their own because of how much interest they can add to an otherwise simple look. And when you pair a variety of textures together in one outfit, things only get better. Here, we went with a delightful combination of structured pleats and shiny sequins for a dressier occasion. For a more casual approach, try incorporating a mix of silk, linen, or lightweight knits into your look. By playing up the contrast of textures in an outfit, you’re able to go from basic to street-style chic in no time. Nothing makes a spring fashion statement quite like a bold, unique silhouette. Experiment with out-of-the-ordinary designs, like a top or dress with a single puff-sleeve or a skirt with an asymmetrical hemline. These fresh updates help bring drama with their avant garde shapes while remaining very wearable. For added intrigue, you can up the ante by also mixing in patterns. Though we kept the overall color palette fairly simple, this look is all about playing by your own rules, so go as bold as you’d like. 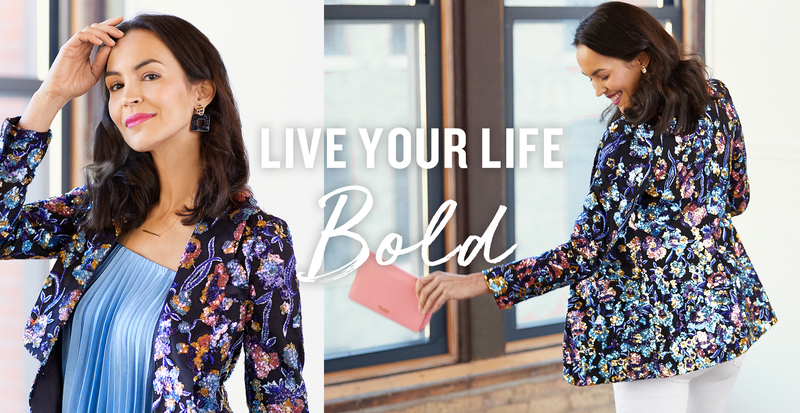 Next time you’re feeling a little daring, step outside of your comfort zone and go bold with your fashion choices.